Who Said Horses Weren’t Expensive? I have a confession. It was not that many years ago that I was afraid of horses. I’m talking you-would-not-find-me-on-the same-side-of-a-fence-with-a-horse frightened. Now as an animal lover, I also thought they were beautiful, but just never could address my fear to get near them. Because quite simply – they are BIG animals! However, for years my dad has had a sweet quarter horse named Buddy that he boarded. And while he paid for boarding and vet bills, he used to say, “Oh, you’ll spend more on your dog to get shots than a horse.” And since I had no point of reference, I believed him. I’ve also come to learn this was his way to gently poke at my mom for the vet bills for their dogs. But let me just say, me oh my have the last five years been an eye opener for me. A Horse Trailer – You can’t put the horse in the backseat of your car. Hay and Feed – If you are in Texas, don’t count on growing it. If drought comes, you might as well feed dollar bills to your horses. Halters – Headstalls, rope halters, bits. Why have one of each when you can have three of each? Pedicures – Not just for you anymore. Those little horsey hooves need pampering too. Your farrier will be your new best friend, and prepare yourself and your checkbook to see him every six to eight weeks. Brushes – There are SO many kinds. We humans have nothing on horses in this department. Muck Rakes – Let’s just say, what goes in must come out, and you’ve gotta have a way to clean it all up. Vet – Oh how I adore my vet. And I’m willing to pay the fee to have him come to me so that I can avoid the rounding up, loading up, hauling, unloading, reloading, hauling home routine. Not to mention the times he has to make a trip out for an ailing equine (and just so you know, it will be night time, the weekend, or a holiday because that’s just how they roll). Fences – Building or repairing, there is always one on the to-do list. Stalls – Every horse needs a wind break from north winds, or a place to get out of the rain (even if they don’t choose to). Random Meds – You must have a medicine cabinet for your horse just in case for cuts, scrapes, aches. Horses are people too! 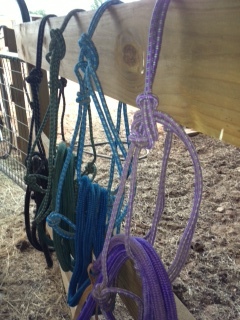 Just a sampling of our rope halter collection. Yes they are color coordinated, and we have a color for each horse. Is there any other way? Needless to say, this is one of those instances in life when I think I am perfectly within my rights to tell my dad he was very, very, very wrong. However, I can also say father knows best. Horses have changed my life. Taught me so much about myself, and I can’t imagine looking out into the farm’s pastures and not seeing my big, loveable guys and gal. So if your heart is leading you to the horse, just make sure you know your way to the bank. I don’t know about Dads, but, you do know . . . Mom ALWAYS knows best!!! I have owned horses since I was eighteen, and they have kept me poor/broke for more than 40 years. But I can’t imagine life without them! My apologies to be so slow in responding, but I just wanted to say thank you so much for reading my blog. I do know what you mean, a beautiful pasture is made glorious when it has horses in it!